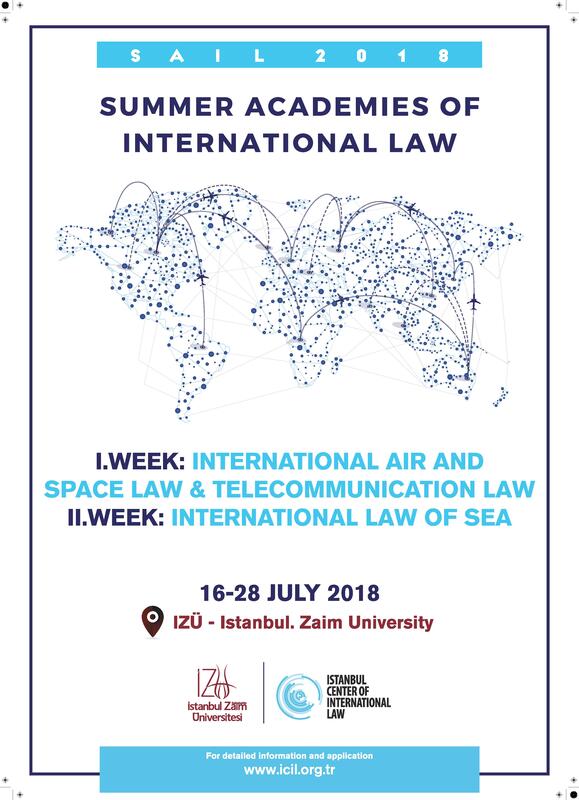 Istanbul Center of International Law (ICIL) is happy to announce the 2nd Edition of Summer Academies of International Law (SAIL). The Academy is designed for students who are seeking to specialize in the sub-fields of International Law in particular, Law of Sea and Air and Space Law. Target Audience: ICIL Formation 1 Students, Advanced Bachelor Students in Law, Graduate Law Students (Master & Ph.D.) and Practitioners. Number of Available Space: As the ICIL Formation 1 students have the priority for the participation to SAIL 2018, we reserved some places to ICIL students. However, we are able to accept 20 other participants from all over the world. IMPORTANT: You can apply to either individual weeks or whole program. There is no requirement to apply for two weeks. All the applications should send 1 page long (450 words max.) motivation letter and updated CVas the application package. Applications will be evaluated on rolling-basis therefore; early application is highly advised to candidates. All the applicants should furnish a proof of their level of English which will allow them to follow the lectures. Places are limited 30 participants including the quota for ICIL Formation 1 Program students (10 approximately). Late applications won’t be taken into consideration. Please be informed that the applications will be reviewed on rolling-basis therefore, we strongly recommend you to file your application as early as possible. Once a candidate receives the letter of acceptation, he or she should make the payment of tuition fee in 10 days. Otherwise, the candidate’s participation will not be finalized. Applicants who are not selected are also informed by e-mail on 10 June 2018. The tuition fee for each individual week is 300 Euros. This fee comprises the accommodation on-campus and the lunches for the lecture days. It is possible to have breakfasts and dinners on-campus for an additional fee of 50 Euros for 5 days. If the participant chooses to participate for two weeks, (S)he benefits from %10 discount for tuition fee. If you need an invitation letter, we are happy to providing you the letter however, please note that we cannot issue the visa letter before the full payment of the tuition fee.